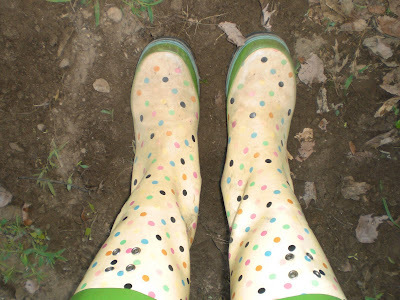 gardening in the boroughs of nyc: My gardening boots! These are the boots I wear when I'm out in the garden. They have gotten so dirty! ;) I like to wear them because the garden is so dusty like the desert because it hasn't rained in like forever! Today they say there will be a 30% chance of rain. Yeah, whatever! I get dirt everywhere when I'm out walking around the garden, so these boots come in handy. Also, when I use the garden hose, I always manage to get water all over the place! I think I might want to invest in better boots though, because these are starting to fall apart. What do you wear when you are gardening? Washable sandals or nothing at all (on my feet, that is). I think your boots are cute! I wear flip-flops or go bare foot. Sometimes crocs, my hunting boots or tennis shoes. Usually whatever I have on when according to the weather. Maybe I should buy a pair of sweet boots! I have "bubber boots" (as my kids call them) too! Mine are black with polka dots, although in the summer I wear flip flops or tennis shoes if I'm sensing snakes that day LOL! I love wearing my wellies/rainboots/galoshes. They're all ripped and getting water inside causes a funny noise. But I like that.